Announcement of the wedding of Mildred Mary French and Walter Joseph Creamer, Jr., that occurred on Sunday, August 17, 1930 at East Eddington, Maine. The married couple would then be living at 38 Forest Avenue, Orono, Maine. Mildred Mary French was born June 8, 1903 in Maine, the daughter of George Asa French and Lillian V. (Hathaway) French. Walter Joseph Creamer, Jr., was born March 3, 1896 at Penobscot, Maine, the son of Walter J. Creamer and Lena (Wardwell) Creamer. 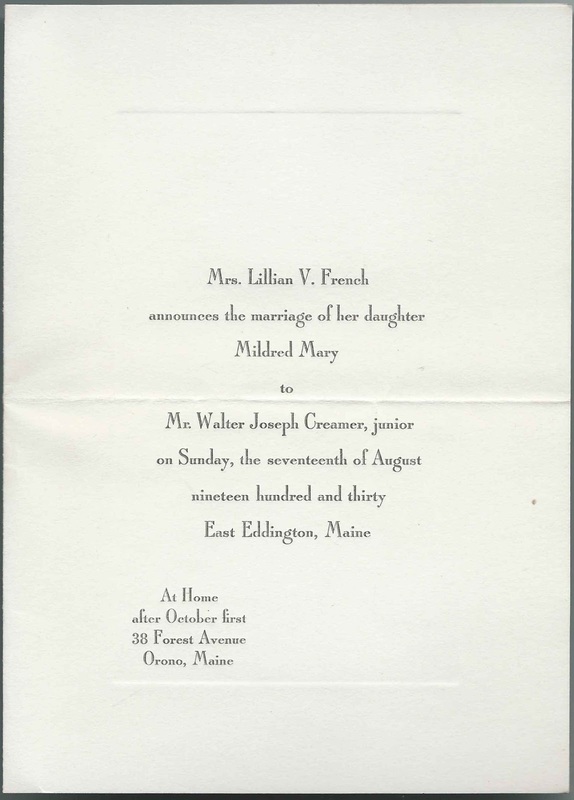 Walter Joseph Creamer, Jr., graduated from the University of Maine at Orono, Maine, in 1918 and became a professor and dean there; it appears that Mildred also attended the University of Maine. Their Find a Grave memorial shows that Walter died in 1977 and Mildred in 1988; they're buried in Mount Hope Cemetery at Bangor, Maine. Please leave a comment if you have information to share, while being careful to respect the privacy of living people or those who may have recently passed away.